Home CDN , children , crafts , December , feature , holiday , holidays , homeschool , papercrafts , printables , US , worldwide December 22nd - Freebies! -- When Colo was born unexpectedly on the cold concrete floor of the zoo on December 22, 1956, the book, How to Raise a Baby Gorilla didn't exist. So the keepers at the Columbus Zoo raised Colo the only way they knew, as if she were a human baby. She wore diapers, drank from bottles, and had an entire wardrobe of baby clothes. 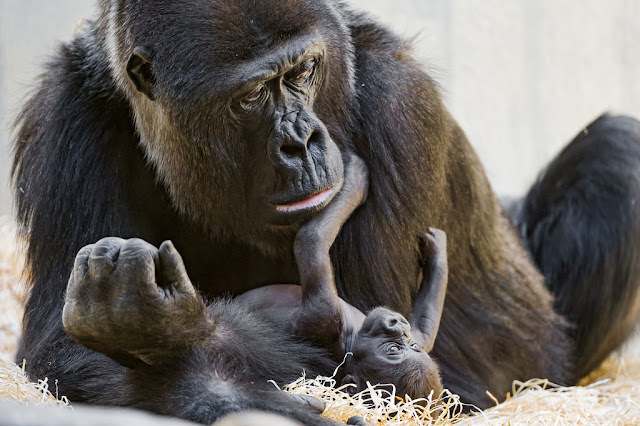 Follow Colo's amazing journey from a cuddly baby, to a feisty toddler, to a mother of three, to the matriarch of one very large gorilla family and now the oldest living gorilla in the world. Colo has done more than live her own amazing life; she has helped teach generations of zookeepers and veterinarians learn what is best for all gorillas in captivity. • Melissa and Doug Giant Gorilla -- Equally at home perched on a child's bed or sitting at the breakfast table, the amazingly lifelike Gorilla from Melissa and Doug may just hitch a ride wherever your little one goes. Long, pliable arms, a kind face and a soft and inviting shape mean everyone will want to give this Gorilla a hug. - The American custom of using electric lights began in 1882 when Edward Johnson an associate of Thomas Edison, hand-wired 80 red, white and blue bulbs and wound them around a rotating evergreen tree. - Honors date nut bread with its delicious flavors perfect for the fall season - Date nut bread is perfect spread with butter and toasted. Serve it for breakfast with a nice hot cup of coffee and you are off to a good start celebrating date nut bread day. Or add a drizzle of icing and serve it as a dessert. - The first thermometers were called thermoscopes and while several inventors invented a version of the thermoscope at the same time, Italian inventor Santorio Santorio was the first inventor to put a numerical scale on the instrument. Galileo Galilei invented a rudimentary water thermometer in 1593 which, for the first time, allowed temperature variations to be measured. In 1714, Gabriel Fahrenheit invented the first mercury thermometer, the modern thermometer. - Forefathers' Day is a holiday celebrated in Plymouth, Massachusetts, on December 22nd. Commemorating the pilgrims landing at Plymouth Rock in 1620. They left for the New World, to escape religious persecution. After a late fall start, the Mayflower set sail from England and landed at Plymouth Rock, Massachusetts just before Christmas. This holiday is celebrated largely in New England.